This weekend, Brentwood Baptist Church hosted a conference on family ministry titled Connecting Church and Home. The speakers were mainly connected with Southern Baptist churches but their purpose will be shared by all Christians. Several of my friends were attending the event. So I asked Terry Delaney to blog it for Ministry-to-Children.com. He did not disappoint. The links below are his in-depth notes taken live during each session. 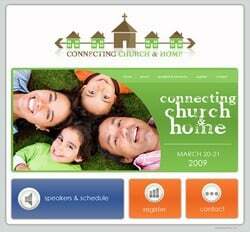 Check out our summary of the 2010 Connecting Church & Home Conference. Browse our posts under the topic family ministry or check out our resource page for family worship. This past weekend (March 20-21), was blessed to be able to attend the Connecting Church and Home Conference at Brentwood Baptist Church in Brentwood, Tennessee. I went in with some biased opinions of what would be discussed and how it would work only to discover that my biases were just that. They were biases based upon a lack of complete understanding. The pre-conference was most helpful. It was here that I learned that churches in rural settings with “only” 50 members were represented as well as churches in excess of 5,000 members. The one common bond we all had was that we recognized that what we have been doing has not been working. By this, I mean that the children and the youth who are attending church are not learning much of lasting value because of our event-driven mindset. When 75% or more of our youth leave the church after high school, we should take a step back and try to figure out why. This weekend was all about learning from others who have plowed before us. They have fought these battles in their churches and they are now seeing the fruit of their ministry by God’s grace and mercy. Most important, this is not another ministry gimmick nor is it another ministry fad. What they are asking for is quite simply a paradigm shift in the way we think about doing ministry. Rather than create a buzz for all the different silo ministries (a term referring to the individuality of each ministry in the local church), the speakers were asking us to create a buzz about the church and how we should be ministering to our families as a whole unit through the various ministries in the church. This is not a family-integrated approach to ministry nor is it an age-graded approach to ministry. Rather, this is more like a marriage of the two. Family-integrated, while it does have its place, jettisons any and all age appropriate ministry. Age-graded, while it too has its place, hardly ministers to the family. The family-equipping model seeks to minister to the family and offer support to them as the parents seek to train up their children in the ways of the Lord. My final thought, and I am keeping this short on purpose, is that I was impressed not only with the wide range of churches represented, but also with the average age of those ministers in attendance. I would say at least 75% of those in attendance were under the age of 40. There were many associate pastors and senior pastors as well as youth pastor and children’s pastors. If you are at a point in your ministry where you are realizing a change is needed, I would investigate the family-equipping approach. Remember, it is not a gimmick or a new way of doing ministry. It is rooted in the Old Testament (Deut. 6) and discussed in the New in many places. It is a paradigm shift from the way we have been doing things to the way God intended for us to do things. If you know of more blog coverage of this event, let me know and I’ll add a link here. I haven’t heard if they are going to post the audio yet. If so, I’ll link it here too. The Connecting Church and Home Conference is designed to equip church leaders with practical ministry strategies for impacting families within the church. Featuring nationally known leaders and ministry speakers, this conference is sure to impact your approach to building stronger families in your church. The conference was held 20-21 March 2009 at Brentwood Baptist Church in Nashville. Special thanks to Terry Delaney who contributed this guest post. To read more of Terry’s writing visit Going To Seminary or Diary of a Seminary Student. Tony Kummer (Editor) reviewed & updated this page on : August 31, 2017 at 1:00 pm. All our content is peer reviewed by our readers, simply leave a comment on any post suggest an update.